Give each of them a hot cross bun from Morrison's and see how long it takes any of them to find a currant in it. They have the nerve to charge extra for buns with actual currants in them! They taste bloody gorgeous though so well worth the extra. rebbonk wrote: The Mrs bought some from Tesco without the cross on them! Or 'currant buns' as they used to be known. The picture doesn't do the Morrison's buns justice. 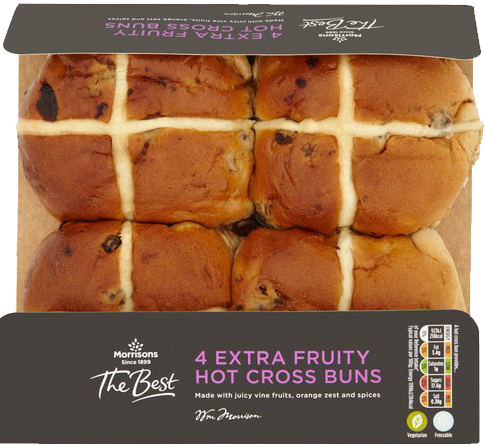 The crosses are much more prominent than they are on the cut-price buns, the inside is bursting with currants and the buns are covered in a shiny, sugary coating.